Indian River Red pomelos are medium to large in size, averaging 15-25 centimeters in diameter, and are globular to oblate in shape. The smooth skin is yellow with visible oil glands that appear like tiny dots on the surface, and the white pith is thick, spongy, and soft with a cotton-like texture. The rosy red flesh is firm with some juice, depending on the individual fruit, and is divided into segments by fibrous, papery membranes. The flesh might also contain a few underdeveloped seeds but are generally seedless. Indian River Red pomelos are plump, tender, and aromatic with a sweet, mild flavor. Indian River Red pomelos are available in the winter through early spring. Indian River Red pomelos, botanically classified as Citrus maxima, are an edible, natural citrus fruit that belongs to the Rutaceae family. 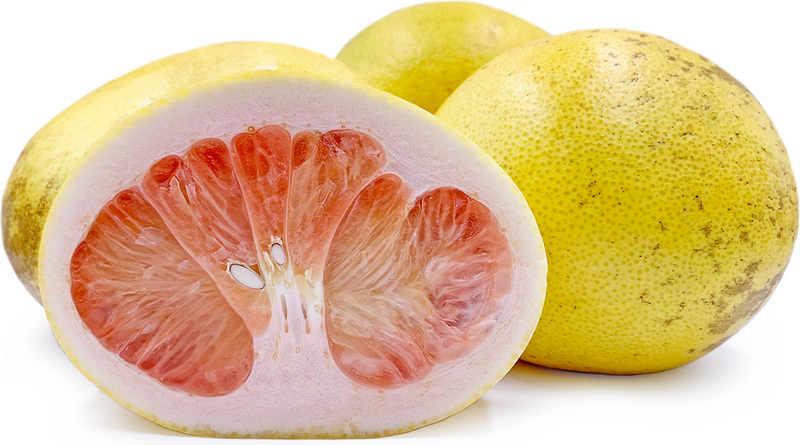 Pomelos are considered to be one of the largest fruits in the citrus family and are often mislabeled as grapefruit even though they are two separate species. Grown along a small stretch of land along the Indian River in Florida, Indian River Red pomelos are known for their sweet flavor due to a specialized combination of sunshine, nutrient-rich soil, and consistent sea breezes, and are recognized internationally for their quality and exceptional flavor. Indian River Red pomelos are an excellent source of vitamin C and also contain potassium, calcium, vitamin A, magnesium, iron, and fiber. Indian River Red pomelos are best suited for raw applications as their sweet flavor is showcased when used fresh, out-of-hand. The thick pith and membranes must be removed prior to consumption and can be peeled away by hand. Once peeled, the segments can be separated and served as a stand-alone snack, sliced and tossed into green or fruit salads, or used as a topping for fruit bowls, ice cream, sorbet, or baked goods. The segments can also be sprinkled with brown sugar, broiled, and served with fish such as salmon or mixed into light pasta dishes. Indian River Red pomelos pair well with avocado, red onion, spinach, honey vinaigrettes, seafood, poultry, pomegranates, papaya, coconut, ginger, lemongrass, peanuts, and herbs such as parsley, basil, tarragon, cilantro, and mint. The fruit will keep up to one week when stored at room temperature and up to two weeks when stored in the refrigerator. The Indian River Citrus District was established in 1807 and consists of a narrow strip of land along the Atlantic coast and beside the Indian River in Florida. Spanning two hundred miles, this district is known for its coquina limestone-rich soil, high rainfall, and extremely flat land. This combination provides nutrient-dense soil for the roots of the citrus trees to tap into, and the flat land provides a consistent layer of water to produce dense, high-quality fruits. The fruit in this district was so popular that in 1930, the Federal Trade Commission had to issue "cease and desist" letters to growers outside of the district labeling their produce as Indian River. Today citrus grown from the Indian River District is in high demand all over the world with the top exports being sent to twenty-three different countries in Europe and Asia. It is also largely sent to the northeastern United States. Pomelos are native to southeastern Asia and have been cultivated since ancient times. The pomelo's journey west began with the East Indian ship captain, Shaddock, who first brought the fruit's seeds to the West Indies from the Malay Archipelago in the mid-seventeenth century. While the exact dates of when the Indian River Red pomelo was developed are unknown, this large fruit is still grown within the small Indian River District in Florida and is exported to other regions in the United States, Europe, and Asia, and is sold at farmers markets and through specialty grocers.